For reasons unknown Northern Cyprus is not high on the wish list of our fellow roadsign spotters. Our man on the bicycle eventually took the challenge and pedalled a tour of both Cypruses. 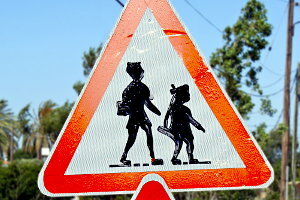 The Children's Crossing Sign he photographed on his last day on the island is common in Turkey. Though it looks like this specific item has received a lick of paint to freshen it up, the effort has not been very successfull. Interesting details of the original — e.g. the footwear— have largely disappeared.